Some breakfast cooks take for granted that the first waffle in the iron will be a sacrificial one. 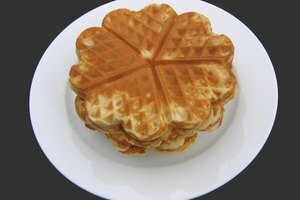 If the first waffle in each batch you cook tends to stick to the iron and breaks apart, there is a better solution that will increase your waffle yield. It requires preparing the waffle iron prior to adding the batter, and it's a practice that you'll want to use every time you make breakfast. Plug in the waffle iron and turn it on. While the iron is warming up, get out a slice of white bread. Dip a basting brush into some vegetable oil and brush a light layer onto each side of the slice of bread. Place the bread in the hot iron and close the lid. 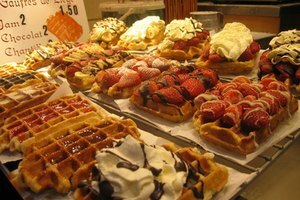 Let it cook for about two minutes, or however long you usually bake a waffle in your particular iron. This process will coat the iron with a light layer of thin, warm oil that will effectively grease the iron and only add a nominal amount of fat and calories. Remove the bread. 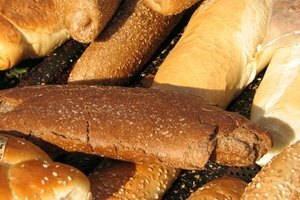 If you're curious, you can eat the bread, but it won't taste like much and it will have absorbed a fair amount of cooking oil. Make your first waffle by ladling waffle batter from a bowl into the waffle iron. Do not wipe or rinse the waffle iron before cooking or between waffles. Subsequent waffles will not stick to the iron. If you only have trouble with sticky waffles when you add berries or other ingredients, this technique should help prevent that problem. How Long Do I Cook Waffles on a Waffle Maker?